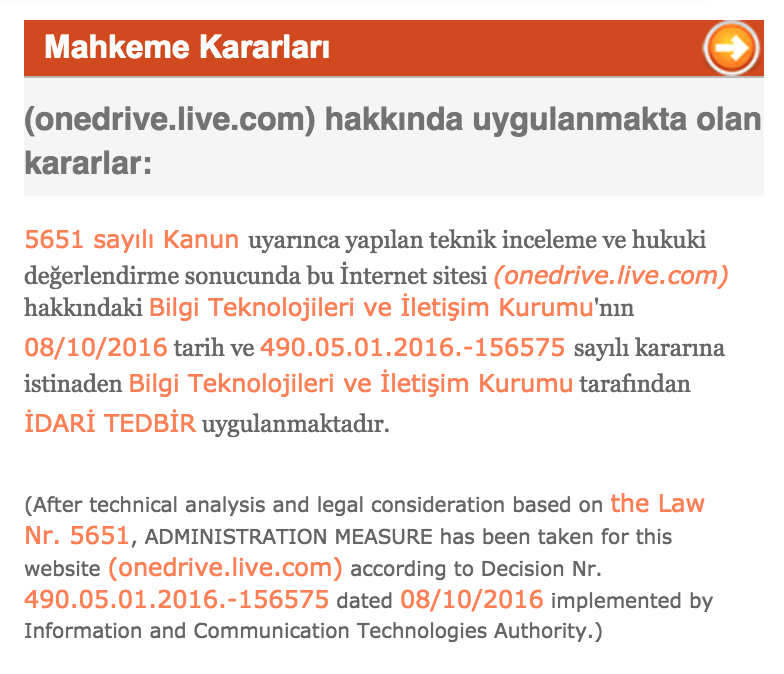 Turkey has blocked access to Dropbox, Microsoft OneDrive and partially restricted Google Drive cloud file sharing services popular on mobile phones as well as in education, business, legal and press industries, following the leak by hacktivist group Redhack of a set of private emails allegedly belonging to Minister of Energy and Natural Resources Berat Albayrak, son-in-law of President Recep Tayyip Erdogan. At the time of writing, Saturday 8 October, both Google Drive and Dropbox services were issuing SSL errors, indicating intercepted traffic at the national or ISP level. Affected ISPs include TTNet, UyduNet and Turkcell. Foreign visitors in Turkey using roaming mobile data are still able to access the services because their data is tunnelled to the country of origin. Dropbox Inc, a privately held company whose board of directors includes former United States Secretary of State Condoleezza Rice, has not yet commented on the block. Google Drive is a Google service that also integrates with other platforms – the loss of access may therefore have a knock-on impact on third-party products. The blocks are expected to heavily impact Google users and Dropbox Inc. customers who use the respective mobile applications, which runs on Android, iPhone as well as desktop computers, to archive their photos, share business documents and sign contracts. While Dropbox is entirely blocked, Google Drive is still accessible to existing users – possibly because Google shares its business cloud hosting infrastructure and servers between Drive and it’s primary services including search. TurkeyBlocks is working to collect forensic data captures of the incident. Most, but not all service providers were affected at the time of writing – the services appear to still accessible to a small number of users in the country not using the main providers.